Sanders R.A., Ralph A.G., Olivier N.B. Cardioversion of atrial fibrillation in a dog with structural heart disease using an esophageal-right atrial lead configuration // J Vet Cardiol. 2014 Dec;16(4):277-81. Atrial fibrillation is a common arrhythmia in dogs with structural cardiac disease and can result in significant clinical signs. Several methods of electrical cardioversion of atrial fibrillation have been described. Biphasic transthoracic cardioversion of atrial fibrillation in dogs with naturally occurring heart disease has been described in veterinary medicine and has been shown to be highly successful. In humans and research animals intracardiac and transesophageal cardioversion of atrial fibrillation has been described as an alternative to transthoracic cardioversion. While transesophageal cardioversion is very successful in humans and research animals, this technique has not been previously described in a clinical patient with naturally occurring heart disease in veterinary medicine. This report describes the use of transesophageal cardioversion in a dog with atrial fibrillation and structural cardiac disease. Cardioversion was unsuccessful using two electrodes positioned within the esophagus. Cardioversion of atrial fibrillation to normal sinus rhythm was successfully achieved and maintained using one electrode positioned within the esophagus and one electrode positioned within the right atrium using a synchronized monophasic shock of 50 J. A 3-year-old, female intact mixed breed dog, weighing 20.3 kg, was referred to the veterinary teaching hospital at Michigan State University’s College of Veterinary Medicine for evaluation of a recently diagnosed murmur and ascites. The dog was presented to the referring veterinarian for evaluation of exercise intolerance, chronic vomiting and diarrhea. The referring veterinarian noted a basilar continuous murmur and an irregularly irregular heart rhythm during the physical examination and referred the dog for further evaluation. Referral blood work available at the time of presentation revealed a mild hypoproteinemia of 4.5 g/dL (reference range, 5.1—7.5 g/dL) with a mild hypoalbuminemia of 2.1 g/dL (reference range 2.5—4.0 g/dL), azotemia with a blood urea nitrogen of 36 mg/dL (reference range 7—27 mg/dL), and hyperchloremia of 118 mEq/L (reference range 105—115 mEq/L). Complete blood count and total T4 were within reference limits for normal dogs. A urinalysis obtained via cystocentesis revealed proteinuria (3+ out of 4+), trace gluco- suria (100 mg/dL), a large amount of heme, pyuria (40—50 white blood cells/hpf), and hematuria (too numerous to count/hpf). Physical examination confirmed a grade 5/6 continuous murmur over the left heart base. The heart rate was rapid with an irregularly irregular rhythm. Femoral arterial pulses were weak and irregular with multiple pulse deficits. No jugular venous distension or pulsations were noted. Abdominal distension with a fluid wave was noted. Electrocardiographic examination revealed atrial fibrillation (AF) with an average ventricular response rate of 275 complexes/min. Echocardiographic examination revealed severe left atrial (left atrial to aorta ratio = 2.1) and left ventricular dilation with systolic dysfunction (fractional shortening 22%, ejection fraction 42%). Color flow Doppler revealed a moderate concentric jet of mitral regurgitation as well as continuous turbulence within the main pulmonary artery consistent with a left-to-right patent ductus arteriousus (PDA). Spectral Doppler evaluation revealed normal trans-aortic and trans-pulmonic forward flow velocities and patterns. Spectral Doppler evaluation of left-to-right flow through the PDA revealed no evidence of pulmonary hypertension. No structural changes of the right atrial or right ventricle were noted on two-dimensional transthoracic echocardiography. Evaluation for noncardiac causes of the ascites was performed. Pre- and post-prandial bile acids were within the reference limits for normal dogs. An abdominal ultrasound revealed a moderate amount of mildly echoic peritoneal effusion, a 6.9 mm hypoechoic nodule in the right liver lobe, with subjective moderate hepatomegaly and dilated hepatic veins. Peritoneal fluid analysis revealed a low cellularity fluid with a total protein of 2.5 g/dL, consistent with a protein-rich transudate. Interventional closure of the patent ductus arteriousus (PDA) and cardioversion of the atrial fibrillation (AF) were recommended. Multiple methods of cardioversion of AF were discussed with the owner including transthoracic cardioversion (TTC), intracardiac cardioversion (ICC) and transesophageal routes of cardioversion (TEC). The owner elected to attempt TEC as a first option followed by ICC and finally transthoracic cardioversion (TTC). Due to the owner’s schedule, closure of the PDA and cardioversion of the AF was postponed until the following week. At the time of discharge, therapy with 1.1 mg/kg (22.5 mg) of diltiazem PO q 8 h, 0.5 mg/kg (10 mg) of enalapril PO q 24 h, and 0.62 mg/kg (12.5 mg) of spironolactone PO q 12 h was initiated. The following week the dog returned for interventional closure of the patent ductus arteriousus (PDA) and cardioversion of AF. The dog was premedicated with 0.5 mg/kg (11 mg) of methadone IM, induced with 3.9 mg/kg (80 mg) of propofol IV, and maintained under general anesthesia using isoflurane to effect in 100% oxygen. The dog also received lactated Ringer’s solution at 10 mL/kg/h throughout the procedure, and 30 mg/kg (640 mg) of cefazolin IV q 90 min peri-operatively. The dog was placed in left lateral recumbency and a 7-Fr introducera was introduced percutaneously into the right external jugular vein using a modified Seldinger technique and secured in the right external jugular vein. A 5- Fr pigtailb catheter was passed to the junction of the cranial vena cava and the right atrium (RA) and a mean central venous pressure (CVP) of 11 mmHg was recorded. A 10-Fr decapolar defibrillating catheterc was passed oroesophageally using fluoroscopic guidance to the level of the carina, with the distal pole just aboral to the carina (Fig. 1). The distal pole of the defibrillation catheter was used as the cathode and the remaining poles of the defibrillation catheter electrically linked to increase the surface area were used as the anode. Transesophageal cardioversion was attempted using a monophasic defibrillatord with the defibrillation shock synchronized to the R waves. Defibrillation was unsuccessful using synchronized shocks of 10 and 20 joules (J). The esophageal catheter was left in place, and a 7-Fr decapolar electrophysiology cathetere was introduced into the right jugular vein and advanced using fluoroscopic guidance into the RA (Fig. 1). To increase the total surface area of the cardioversion electrodes, poles 1—6 of the esophageal catheter were electrically linked and used as the cathode while poles 1 —10 of the decapolar electrophysiology catheter were electrically linked and used as the anode. Confirmation of catheter and electrode positions was repeatedly confirmed fluoroscopi- cally. Atrial cardioversion was unsuccessful using synchronized monophasic shocks of 10 and 20 J but was successful following a synchronized monophasic shock of 50 J (Fig. 2). After 5 min of normal sinus rhythm the mean CVP was again measured and found to be 10 mmHg. Following successful cardioversion of atrial fibrillation (AF) to normal sinus rhythm, the PDA was closed in routine fashion using a 12 mm canine duct occluderf placed through the left femoral artery using a percutaneous approach. Complete occlusion of the PDA was confirmed by transesophageal echocardiography with color flow Doppler. The CVP remained unchanged immediately following PDA closure. Post-operatively the dog was administered 0.25 mg/kg (5 mg) of methadone IV and 0.025 mg/kg (0.5 mg) of acepromazine IV, followed by 3.7 mg/kg (75 mg) of tramadol PO q 8 h for analgesia when awake. The dog was monitored with continuous ECG overnight, with isolated atrial premature complexes noted periodically. A transthoracic echocardiogram and ECG were performed 24 h after the procedure. No residual flow was noted through the PDA. No dramatic changes in systolic function or cardiac size were noted at this time. The ECG revealed normal sinus rhythm with no abnormalities. The dog was discharged 24 h after the procedure without complication. Therapy with enalapril and spironolactone was continued while therapy with diltiazem was discontinued at that time. The dog was re-evaluated at 6 weeks and at 6 months after patent ductus arteriousus (PDA) closure and cardioversion. At recheck the physical examination revealed no abnormalities. No complications were reported by the owner at any time. At each recheck an ECG revealed a normal sinus rhythm and echocardio- graphic examination showed complete closure of the PDA. At the 6 month echocardiographic examination mild decreases in left atrial and ventricular dilation and mild improvement in systolic function were noted. A brief abdominal ultrasound confirmed the absence of ascites at each recheck. Intracardiac cardioversion of atrial fibrillation (AF) has been evaluated in humans and animals. In humans, intracardiac methods of atrial cardioversion have been evaluated and have been shown to have similar cardioversion rates as TTC with significantly lower energy requirements to achieve cardioversion.3—5 Unfortunately these studies compared monophasic transthoracic cardioversion (TTC) to biphasic ICC and this may have affected the outcome biasing ICC. However, when ICC was compared to transthoracic cardioversion (TTC) using a monophasic waveform in each case, the cardioversion threshold was found to be significantly lower.6 Unfortunately, at this time there are no large scale studies directly comparing biphasic ICC to biphasic transthoracic cardioversion (TTC). In research dogs with induced AF, studies have shown ICC to be effective at very low cardioversion thresholds of less than 5 J (cardioversion waveform morphology not reported).7,8 Multiple electrode positions have been evaluated for intracardiac atrial cardioversion to identify the optimal electrode position. It has been demonstrated in both people and research animals that ICC with one pole in the RA and one in the coronary sinus results in the lowest atrial cardioversion thresholds.9,10 While in horses with naturally occurring AF, atrial cardioversion with one pole in the RA and one pole positioned in the left pulmonary artery has been reported to be successful in 98% of patients.11 Intracardiac conversion of AF in dogs with naturally occurring heart disease has not been described. The arrowheads indicate synchronization of the defibrillator with the QRS complex. The asterisks mark small P waves. Paper speed of 25 mm/s. Despite the low cardioversion thresholds associated with ICC, transesophageal cardioversion (TEC) has been evaluated as a less invasive method of atrial cardioversion that would not require fluoroscopic guidance or cardiac catheterization while maintaining low cardioversion thresholds. Cardioversion of atrial fibrillation (AF) with one electrode positioned within the esophagus and an epidermal thoracic patch as the anode has been demonstrated to have significantly lower defibrillation thresholds than TTC with no significant differences in safety.12,13 Biphasic cardioversion of atrial fibrillation (AF) with one electrode positioned within the esophagus and one electrode within the RA has been investigated in people refractory to transthoracic cardioversion (TTC) and was demonstrated to be safe and effective with low cardioversion thresholds.14 Monophasic TEC with both electrodes positioned within the esophagus has also been shown to be effective and safe.15,16 However, no direct comparisons between TTC and transesophageal cardioversion (TEC) with both electrodes within the esophagus have been performed in people. There have been few studies investigating transesophageal cardioversion (TEC) of atrial fibrillation (AF) in dogs. In research dogs with induced AF or flutter, TEC has been compared to cardioversion using a single electrode positioned within the esophagus with an epidermal thoracic electrode and with transthoracic cardioversion (TTC) (a monophasic shock was used in all configurations).17 No significant difference in atrial cardioversion thresholds were found between the two TEC configurations, however both TEC configurations resulted in significantly lower cardioversion thresholds compared to transthoracic cardioversion (TTC). No significant difference in atrial cardioversion thresholds were found between TEC and cardioversion using one esophageal and one epidermal thoracic electrode.7 However, both TEC and cardioversion using one esophageal and one epidermal thoracic electrode resulted in lower cardioversion thresholds than TTC.7 In this study AF was induced by rapid atrial pacing in otherwise normal animals and thus the results may not reflect the efficacy of TEC in animals with significant structural heart disease. 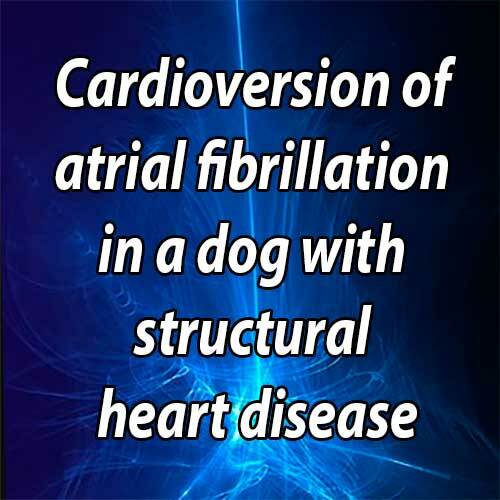 No studies involving TEC of naturally occurring atrial fibrillation (AF) in dogs have been described. Cardioversion of atrial fibrillation (AF) carries inherent risks of complication regardless of the method of cardioversion. Risks associated with electrical cardioversion are rare and include, but are not limited to, shock induced myocardial damage, induction of ventricular arrhythmias, induction of bradycardia, and thromboembolic disease. However, ICC and transesophageal cardioversion (TEC) may have unique risks associated with catheterization of the heart and esophagus. Studies in people have shown the risk of unique complications associated with ICC to be minimal.9 In one study of 500 human patients, 1118 intracardiac shocks were delivered with no major complications noted.9 This may be due to the low levels of energy used to perform atrial cardioversion using ICC. The safety of atrial cardioversion using transesophageal routes has also been evaluated in people and research animals. Minimal esophageal damage has been noted on endoscopic examination and no long term complications were reported in any study.14,17 As such TEC and ICC appear to be safe alternatives to transthoracic cardioversion (TTC). 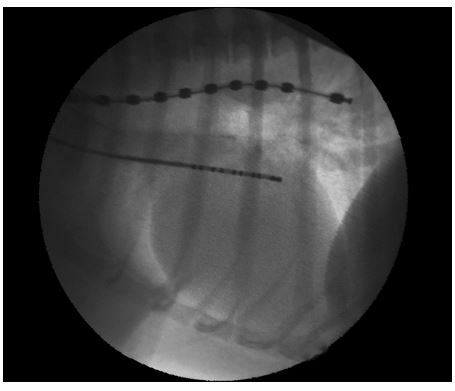 This report highlights the first reported synchronized cardioversion of atrial fibrillation (AF) secondary to structural cardiac disease in a dog using an electrode positioned within the esophagus and an electrode positioned in the RA. Using a synchronized 50 J monophasic shock, atrial cardioversion was successfully achieved in this dog without observable complications. Lower levels of energy may have been successful but the minimal possible step up was not used in this patient to minimize the total level of energy used. Use of a biphasic waveform to perform cardioversion is recommended and should provide lower cardioversion thresholds and therefore less myocardial damage compared to a monophasic waveform. Cardioversion attempts with both electrodes positioned within the esophagus were unsuccessful, however it is possible that defibrillation using a biphasic waveform or higher levels of energy would have been successful. Further evaluation of transesophageal cardioversion (TEC) and ICC of atrial fibrillation (AF) is necessary to determine if these methods will provide a low energy alternative to transthoracic cardioversion (TTC) in dogs with naturally occurring heart disease. No authors have any conflicts to disclose. Van Vleet JF, Tacker Jr WA, Cechner PE, Bright RM, Greene JA, Raffee MR, Geddes LA, Ferrans VJ. Effect of shock strength on survival and acute cardiac damage induced by open-thorax defibrillation of dogs. Am J Vet Res 1978;39:981-987. Bright JM, Martin JM, Mama K. A retrospective evaluation of transthoracic biphasic electrical cardioversion for atrial fibrillation in dogs. J Vet Cardiol 2005;7:85-96. Ozdemir M, Turkoglu S, Kaya MG, Cengel A. Prospective randomized trial of transthoracic versus low-energy internal cardioversion in persistent atrial fibrillation: long term follow-up. Int Heart J 2006;47:753-762. Yalcin R, Kaya MG, Ozdemir M, Cemri M, Timurkaynak T, Boyaci B, Cengel A. Prospective randomized trial of transthoracic versus low-energy transvenous internal cardioversion in persistent atrial fibrillation. Acta Cardiol 2004; 59:521-526. Friberg J, Gadsb0ll N. Intracardiac low-energy versus transthoracic high-energy direct-current cardioversion of atrial fibrillation: a randomised comparison. Cardiology 2003;99:72-77. Alt E, Ammer R, Schmitt C, Evans F, Lehmann G, Pasquantonio J, Schomig A. A comparison of treatment of atrial fibrillation with low-energy intracardiac cardioversion and conventional external cardioversion. Eur Heart J 1997; 18:1796-1804. Kumagai K, Yamanouchi Y, Tashiro N, Hiroki T, Arakawa K. Low energy synchronous transcatheter cardioversion of atrial flutter/fibrillation in the dog. J Am Coll Cardiol 1990; 16:497-501. Dunbar DN, Tobler HG, Fetter J, Gornick CC, Benson Jr DW, Benditt DG. Intracavitary electrode catheter cardioversion of atrial tachyarrhythmias in the dog. J Am Coll Cardiol 1986;7:1015-1027. Andraghetti A, Scalese M. Safety and efficacy of low-energy cardioversion of 500 patients using two different techniques. Europace 2001;3:4-9.
Cooper RA, Alferness CA, Smith WM, Ideker RE. Internal cardioversion of atrial fibrillation in sheep. Circulation 1993;87:1673-1686. McGurrin MK, Physick-Sheard PW, Kenney DG. Transvenous electrical cardioversion of equine atrial fibrillation: patient factors and clinical results in 72 treatment episodes. J Vet Intern Med 2008;22:609-615. Mazza A, Fera MS, Pugliese M, Leggio M, Bendini MG, Poli V, Manzara C, Minardi G, Pino PG, Pompa D, Fiorella AT, De Santis F, Giovannini E. Biphasic transoesophageal vs. transthoracic electrical cardioversion of persistent atrial fibrillation. J Cardiovasc Med (Hagerstown) 2006;7: 594-600. Santini L, Gallagher MM, Papavasileiou LP, Romano V, Topa A, Di Battista L, Aracri M, Romeo F. Transthoracic versus transesophageal cardioversion of atrial fibrillation under light sedation: a prospective randomized trial. Pacing Clin Electrophysiol 2007;30:1469-1475. Santini M, Pandozi C, Colivicchi F, Ammirati F, Carmela Scianaro M, Castro A, Lamberti F, Gentilucci G. Transoesophageal low-energy cardioversion of atrial fibrillation. Results with the oesophageal-right atrial lead configuration. Eur Heart J 2000;21:848-855. Lukoseviciute AJ, Peculiene IR. Transesophageal cardioversion of resistant atrial arrhythmias. Resuscitation 1980;8:159-165. Yamanouchi Y, Kumagai K, Tashiro N, Hiroki T, Arakawa K. Transesophageal low-energy synchronous cardioversion of atrial flutter/fibrillation in the dog. Am Heart J 1992;123: 417-420. McKeown PP, Croal S, Allen JD, Anderson J, Adgey AA. Transesophageal cardioversion. Am Heart J 1993;125: 396-404.